Be the first to hear about their new releases and deals. 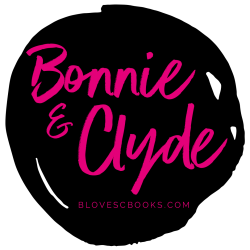 Download the Booksprout app and search for Bonnie & Clyde today! BONNIE KENNEDY has loved romance novels her entire life. As a little girl, she would sneak romance novels from her mother’s bookshelf and read them while in school. The middle daughter of three children, Bonnie grew up in an Army household, changing schools frequently. She spent her early years in Germany before following her father’s Army posting throughout the American South and Midwest. Bonnie has been writing romance since 2011. During that time she has also been a science journalist and copywriter among other occupations. She lived briefly in the Midwest until moving to California with Clyde in 2018. Bonnie writes romantic suspense with dark and twisty vibes. She’s silly and fun when she wants to be and an amazing woman naturally. At the time of this writing, she’s also rolling her eyes because Clyde is the one writing her author biography and he is very much in love with her so he’s sort of biased. CLYDE KANE is an ex-Wall Street investment banker. He graduated from UC Berkeley with a degree in Business Administration and Political Science before going to Yale Law School. He didn’t finish, rather going to work after his second year. He worked for Goldman Sachs and then BlackRock. After seven years of living in New York City, Clyde moved as an expatriate to London where he ran a private equity fund. From there Clyde moved to Hong Kong, then Singapore, then Sydney. In 2015 Clyde began to tire of the Wall Street life and by early 2016 had left his position to strike out and make his fortune for himself. He began a series of businesses and began to write. This is how he met Bonnie. At first Bonnie was a curiosity to him that intrigued him. But the more he got to know her, the more he wanted more. And so by 2018, Clyde and Bonnie joined forces. What happened next defied even their expectations. And it continues…to this day.